Almost half of the world’s population live in cities, and the urban population is growing much faster than the rural population. This mass migrating into cities and urban areas is a good reason for you to know about urban dynamics. It is a fact that the form, size, and function of urban settlements is always changing. The CollegeBoard wants you to know that there are factors that initiate and drive both urbanization and suburbanization. Two of those factors are site and situation. Site and situation influence the origin, function, and growth of cities and is an important concept to understand when you study cities and urban land use for the AP Human Geography Exam. This study guide will explain the difference between site and situation in the context of AP Human Geography. Urban settlements date back more than 5,000 years. You will find the world’s first cities in Mesopotamia and Egypt, China, and Meso-America (modern-day Mexico). Why did cities first develop in those areas? There was a combination of factors like agricultural surplus, access to a water source, increasing population, defense, religion, and trade. The center of every advanced civilization is the city. The city acts as the hub of a geographic region or area and is the agent for political, economic and social activities. The larger the city becomes, the more it serves as a powerful force within its sphere of influence. There is a myriad of functions that the city provides its residents. Those functions include transportation, communication, retail and wholesale operations, political, medical, safety, defense, legal and financial services. A city does not operate independently but relies on other cities within the region, and often has a particular role or purpose, within that region. Almost all cities were well planned out before being built, taking into account two crucial locational aspects. Those aspects were site and situation; two terms that are important in the study of geography. The origin, function, and growth of a particular settlement depend upon both its site, as well as its situation. Settlements can be rural, a small village, for example, with a small population, or urban, as a large city with a population in tens of millions. Site and situation can be confusing, even to those familiar with human geography. 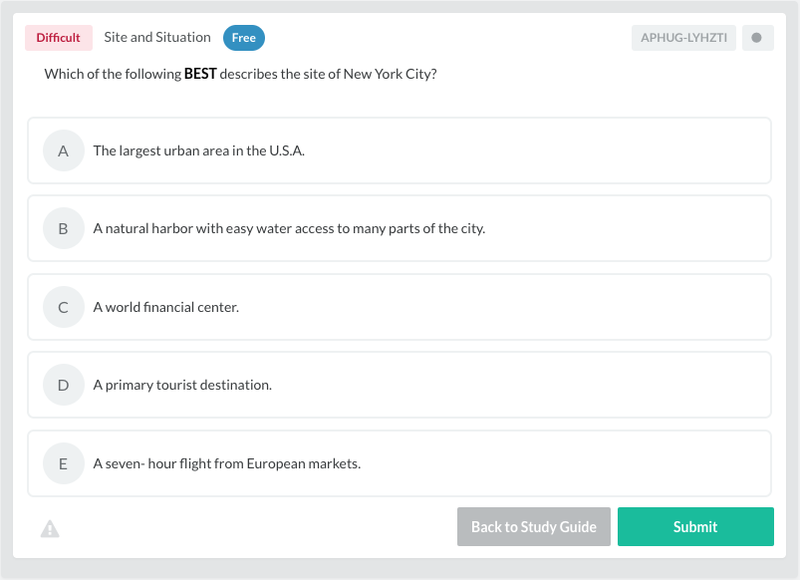 This AP Human Geography crash course will explain the differences between site and situation to make it clearer for you when you see them as either a multiple-choice or FRQ on the AP Human Geography Exam. Site – The exact placement of a settlement on the Earth. If you know its GPS coordinates, you can find it on your smartphone. Cities are part of the urban hierarchy. Where they stand in, the hierarchy depends on many factors: population, the number of services, and its sphere of influence. For purposes of this study guide, and the AP Human Geography Exam, we will be discussing urban settlements or cities. A city’s site refers to the actual physical attributes of the place it occupies. The land could be flat or hilly. It could lie on a river or a lake. It could have a deep water port. It could have obstacles for expansion like ridges or marshes. These are conditions that people consider when choosing the site of a city if those conditions are favorable for living. Cities with potential for growth have the advantage of a favorable site. Those favorable conditions would be access to a plentiful/potable water source, material for building homes and businesses, an abundant source of fuel for energy, natural barriers to defend the city against enemies and mother nature, climate, flora/fauna, and condition of the soil. You must also consider the ability to trade when choosing a site for a city. Bodies of water were vital to trade in preindustrial times to allow trade through their ports. Most of the world’s largest cities were settled on rivers, particularly in the location where they reach the ocean or sea. Many times, this was the first point that explorers landed. For example, the site of Sydney, Australia, took advantage of the superior, natural harbor, favorable for trade, and surrounding arable farmland. Rome, Athens, and Jerusalem were built on hilltops because they were a natural barrier for the defense of the city. History shows us that if these conditions are favorable for living, settlements develop and grow into major cities like New York and Paris. Paris was founded on an island in the Seine River. This site could be easily defended and where crossing the Seine was frequent. When the settlement on this site began was probably during pre-Roman times, but it functioned as a Roman outpost for 2000 years. For many centuries, this favorable defense aspect continued to be vital to the growth of Paris, because the central government at that time was historically weak. In the end, Paris outgrew the island and started expanding its settlement to the banks of the Seine River, but that did not lessen the importance of the security it provided to the government. The site of a city can also create challenges for its inhabitants as well. Cities located in climates that are inhospitable for humans or agriculture, or extremely rugged, puts the fate of the population in the hands of others, to provide resources they are not able to produce. Situation – Where a city is, in relation to its surrounding features. Those features could be natural surroundings (mountains, rivers, roads), nearby areas of productive capacity, the size of its hinterland (an inland area found behind a port and claimed by the power that owns the coast), the location of competing cities, and transportation routes. In other words, situation is the greater regional framework in within which the city finds itself. It is not just the encompassing human-made characteristics that are part of a city’s situation, but also the natural physical features that surround the city. The growth of a city depends on the accessibility and availability of natural resources. Baghdad had an extremely favorable situation because it had command of land between the Tigris and Euphrates rivers. Access to long distance commerce was also a favorable situation for cities grew up along trade routes. Examples are Xi’an, China on the Silk Road, Timbuktu, Mali on the Trans-Sahara trade route and maritime trade that helped Singapore prosper. Using Paris again as an example, its situation was advantageous to rapid growth. Paris lies near the center of a large and prosperous agricultural area, and as a growing market, interactions with these regions continued to increase. The Seine River is navigable by river traffic, with several tributaries navigable as well. This route led to the Lorraine industrial area and the area of coal-based manufacturing near the Belgian border. A radial road system was developed in the area during Napoleon’s reign. Like Roman roads that focused on Rome, all of these roads led right to Paris. The situation of a city is the most important factor for its future and whether it grows into a large city or stays a small town. As cities grow and develop, the predominance of these factors that make up their situation will determine whether or not the city will prosper in the long run or decline and become a victim to urban decay. What is the Difference between Site and Situation? Now that you know what site and situation are, you can determine the difference between the two human geography terms. Site is the exact location of a city, you can find it on a map. The situation of a city relates to its surrounding features, both human-made and natural. The site of a city has features that are inherent to its location. The situation of the city includes characteristics that are external to the settlement. The site is the land that the city was built upon. The situation contains the surrounding areas of the city. Are Site and Situation Still Important Today? We saw that in the case of Paris, a city’s site and situation play an important role in its growth and these factors play out again and again throughout the history of urban development as factors in making great cities the prosperous urban centers that they are today. This will be true as we move forward as well. Whether a city grows or becomes another victim of urban decay, still depends on their site and situation. Technological advances in transportation and communication may help to mitigate some of the negative aspects of a city’s site or situation, by bringing countries closer together. The CollegeBoard has devoted an entire unit, “Cities and Urban Land Use”, to urban geography. You are expected to understand several central concepts within this section and site and situation are the first topics they identify. For the both the multiple-choice and FRQ sections of the AP Human Geography exam, you can expect several questions relating to urban geography. Questions on site and situation have, in the past been limited. But knowing these concepts will help you to understand the broader ideas, such as urban geography, world cities, and megacities that tend to be tested more heavily. When it comes to the exam, you should be prepared to know the definition of site and situation and the difference between the two terms. It is also good to know how site and situation have influenced the origins of a city and its long-term growth and future. How are you going to approach this subject when you study for the exam? For many, site and situation may seem similar and easy to confuse. The easiest way to differentiate them is to remember that the site of an area is its exact location and the situation describes its surrounding areas and physical features. Favorable features of site and situation will ensure that the city will be able to thrive and survive. The site of a city that has access to a good water supply, abundant sources of fuel, natural barriers against invasion and a temperate climate all point to progress and growth. The situation of the city in relation to other settlements in the region is advantageous to its future. Good luck in your quest to do well on the AP Human Geography Exam. There are other AP Human Geography resources you can use to help you prepare for the exam!